This little bisque Kewpie is a such cutie pie! She'll charm you with that sweet face - her painted, side glancing eyes and closed, smiling mouth. Her coloring and dress says Native American, but as you can see, the darker coloring only goes so far. Her belly down to her feet are a much lighter skin-tone shade. 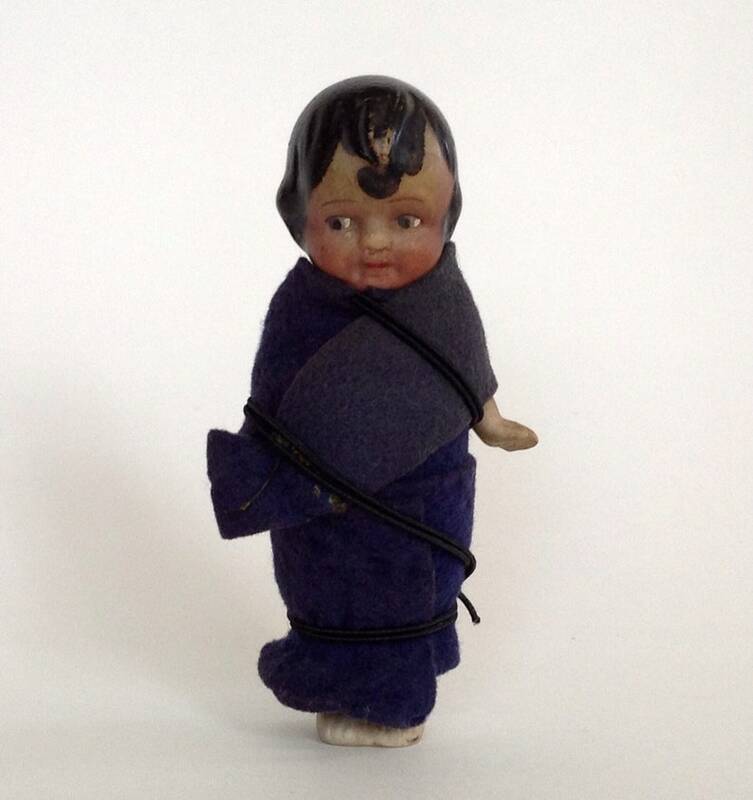 She is "papoosed" in a faded and worn strip of blue felt. I have no idea if this was the original outfit, but when I found her, the felt was attached by a broken and disintegrating rubber band. I have retied the cloth strip on with a piece of black elastic - easy to replace or remove if you so chose. In this particular model, the feet are together and she is able to stand on her own. The moveable, jointed arms are still attached and move freely. Other than being a little dirty (I have not attempted to clean), this gal is in excellent condition given her age and intended use. There are no breaks, repairs, chips or fleabites. The dark "hair" paint has worn off in places here and there. She measures 4 1/4" tall and 2" wide (in hands down position). A lovely AND different addition to a Nippon or Kewpie doll collection.